BENTON Snail Bee High Content Essence contains Snail Secretion Filtrate, Niacinamide and Bee Venom to improve skin tone and texture, leaving you with younger, smoother skin. Suited for all skin types. Highly recommended for acne prone skin. If you purchase this product you will earn 5-24 Points! This essence is packed full of antioxidants and anti-ageing ingredients that protect your skin. Snail Secretion Filtrate (Snail Mucin) improves skin elasticity and reduces acne scars while hydrating your skin. EGF & Niacinamide retain moisture and promote skin cell rejuvenation. Bee Venom will plump your skin, helping to minimise the appearance of wrinkles. 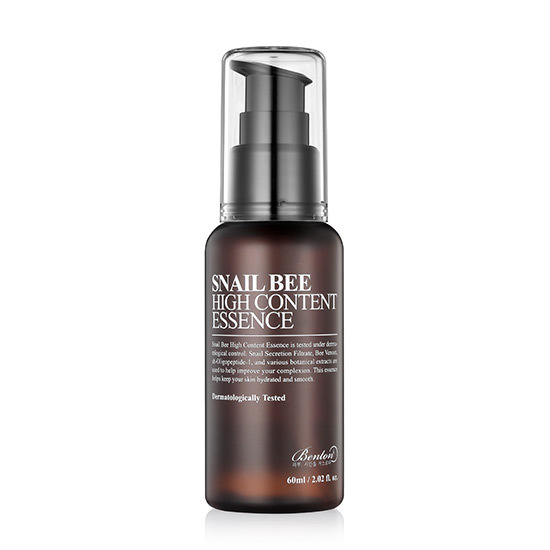 Benton Snail Bee High Content Essence will keep your skin looking young and radiant. Bee Venom – a natural anti-ageing ingredient that penetrates deep into the skin and keeps it firm and plump. It is also anti-inflammatory and can help heal acne. Free from: Artificial Fragrances and Colourants. Our whole BENTON range is available here. After cleansing and toning, use 1-2 pumps of product and apply evenly over your whole face. Pat in the essence until absorbed.